Reprint. Originally published: New York: Minotaur, 2018. In The Throne of Caesar, award-winning mystery author Steven Saylor turns to the most famous murder in history . . . It's Rome, 44 AD, and the Ides of March are approaching. Julius Caesar has been appointed Dictator for life by the Roman Senate. Having pardoned his remaining enemies and rewarded his friends, Caesar is now preparing to leave Rome with his army to fight the Parthian Empire. Gordianus the Finder, after decades of investigating crimes and murders involving the powerful, has finally retired. But on the morning of March 10th, he's summoned to meet with Cicero and Caesar himself. Both have the same request - keep your ear to the ground, ask around, and find out if there are any conspiracies against Caesar's life. Caesar, however, has one other important matter to discuss - he is going to make Gordianus a Senator when he attends the next session on the 15th of March. 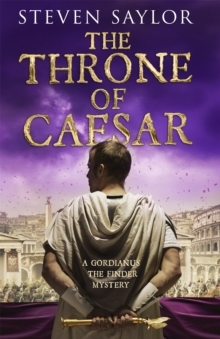 With only four days left before he's made a Senator, Gordianus must dust off his old skills and see what conspiracy against Julius Caesar, if any, he can uncover. Because the Ides of March are approaching... Praise for Steven Saylor'A compelling storyteller, with a striking talent for historical reconstruction' Mary Beard'Saylor's scholarship is breathtaking and his writing enthrals' Ruth Rendell'The most reliably entertaining and well-researched novels about the ancient world [are] Steven Saylor's tales of the Roman proto-detective Gordianus the Finder.